SSA is completing initial development and validation of a seaweed modeling tool within a geographical information system to support the growth of seaweed farms in the United States. Seaweed AquaModel was developed exclusively by our team and some of the collaborators listed below and is presently a "beta" software system undergoing preliminary testing in Hood Canal, Washington State. 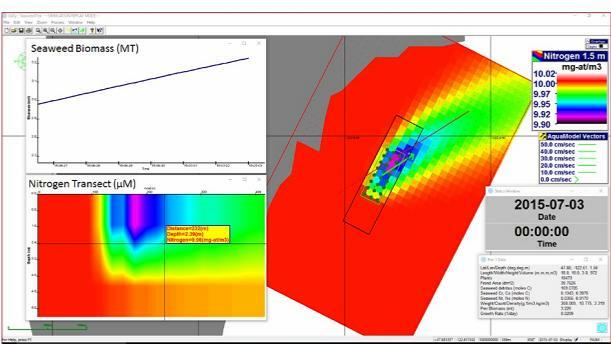 It is a companion software product of a well-known fish farm modeling system known as AquaModel. Used by NOAA National Ocean Survey and several foreign governments, Fish AquaModel calculates the growth, waste production, benthic and water column effects of floating fish farms. The Seaweed AquaModel calculates the growth and nutrient assimilation of macroalgae farms and effects on carbonate chemistry. Specifically, Seaweed AquaModel simulates nutrient flux by the cultured macroalgae as well as nitrogen-phytoplankton-zooplankton kinetics in ambient waters. The system is designed to help farmers, investors and regulators of seaweed farms select optimal sites for farming and determine appropriate size scales of operations. The simulation model generates dynamic maps of conditions within and around the kelp farm, helping users assess adverse interactions with existing uses along the coastline and avoid placing farms in waters where physical and biological conditions at times of the year are detrimental to operations and production. 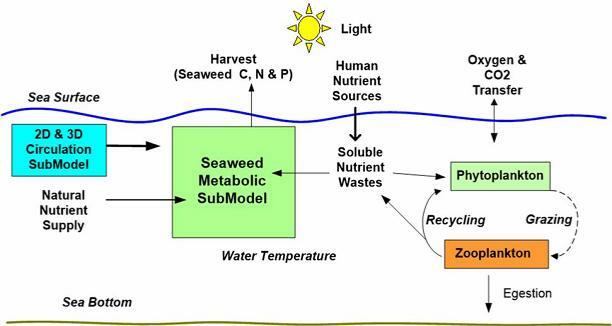 Examples of factors that are critical for seaweed farm site selection that are either inputs or outputs of the calculations include water quality (e.g. algal blooms, pollutants), temperature, nutrient concentration, flow rates at different depths, wave height and/or wind speed. The goal of the modeling tool is to help direct siting and spacing for optimal development of kelp farms throughout North America but initially in the Northeast United States, the Gulf of Maine where commercial farms are already operating, and in parts of Puget Sound including the Strait of Juan de Fuca, where kelp farms are absent, but where conditions for developing farms appear at first glance to be most promising. We anticipate altering the existing architecture of Seaweed AquaModel to be more user friendly than the research version presently used that has components designed for ocean acidification research. The software will be available in self-installing Windows format including a free basic version sufficient for siting and analysis of individual farms. A far field version will also be available commercially for analysis of the effects of several farms over large coastal areas. Our prototype Seaweed AquaModel simulation of the experimental Hood Head sugar kelp farm addresses the need to sequester excess nitrogen in coastal waters and to quantify positive effects of kelp culture by reduction of ocean acidification. Concurrently the software is designed for dynamic mapping of infrastructure, environmental and ecological conditions at farm sites and nearby. Fish AquaModel, which has been developed over the last ten years with support from NOAA, the US Department of Agriculture, private fish farming companies and foreign environmental government agencies, provides a ready-made GIS and simulation tool for engineering the biological and ecological dynamics for individual kelp farms as well as large scale calculations for multiple farms distributed along a coastline. The model has been validated with laboratory measurements of fish growth and metabolism as well as from field measurements from fish farms in Hawaii and commercial Atlantic salmon farms in Chile, Washington state, and Canada (Rensel et al. 2007, 2015). A flow field which includes advective and turbulent transport of dissolved inorganic nitrogen, carbon dioxide, and oxygen to and from one or more farms: The flow field model may be calculated from current meter measurements or 3D circulation model output. The subroutine includes the exchange of CO2 and oxygen across the sea surface. A metabolic subroutine of the transformations of carbon, nitrogen, and oxygen by kelp growth on the array of grow out lines within the farms: This model includes the spatial configuration of grow out lines, seeding and harvesting operations. The metabolic model is described below. An ecological/physiological subroutine of the transformation of the three elements by the phytoplankton and zooplankton community: This subroutine also includes the transmission of light within the water column. We note that because the growth of phytoplankton and macroalgae are photosynthetic organisms they compete for both light and nutrients. Zooplankton on the other hand recycles nutrients to both macro and microscopic algae. Our Saccharina latissimi metabolic subroutine is a modification of a model developed by scientists Broch and Slagstad (2012). This model simulates the transformations of carbon and nitrogen in algae during an annual cycle in a Norwegian fjord to provide accurate simulations of monthly changes in frond size, carbon and nitrogen content as measured by Sjotun (1993). We draw extensively from the work of Dr. Charlie Yarish at the University of Connecticut and his colleagues (e.g., Kim et al. 2015) and are pleased to also coordinate with Dr. John Forster who has promoted and advocated seaweed agronomy for many years. The system tracks the uptake of carbon dioxide and dissolved inorganic nitrogen into labile energy and material reserves of carbon and nitrogen that are then assimilated into structural carbon and nitrogen leading to growth. The uptake rates of carbon and nitrogen into the reserves can be limited by light supply, both day length and light intensity within the upper water column, and the supply of nutrients, in terms of current flow and nutrient concentration. In turn the assimilation of carbon and nutrient reserves into structural compounds are determined by the cellular concentrations of the reserves, temperature, and age or size of the fronds. The system of equations also includes terms for leakage or excretion of reserves and the loss of tissue caused by erosion. Finally, we have improved the model by incorporating an improved description of light absorption and carbon fixation derived by Kiefer (1993) and an improved description of kelp respiration, as well as by adding a subroutine of the response of the oceanic inorganic carbon system to photosynthesis and respiration. The above figure is a screen print from a simulation with the beta version of Seaweed AquaModel for an existing kelp farm in Washington State simulated within the EASy GIS software architecture. The main image represents dissolved inorganic nitrogen with a deficit plume exiting the kelp farm. A tidal current vector (green arrow) changes on any user-selected time scale from minutes to weeks. Two of many available plots are shown to the left (seaweed biomass and nitrogen transect) and the right side plots are self-evident except for the box at bottom right which tracks a range of different statistical outputs including kelp chemical contents, weight, biomass, growth rate. Project PI: Professor Dale Kiefer (USC), biological oceanographer with System Science Applications, Inc. (SSA). Responsible for project management, conceptual and mathematical (Mathmatica) modeling, and reporting. Project co-PI: Dr. Jack Rensel, AquaModel principal: SSA Inc. and owner of Rensel Associates Aquatic Sciences. Responsible for coordinating kelp farm model validation field work and analyses with collaborating entities, interpretation of results, reporting and conducting workshops. He has four decades experience with floating aquaculture research & development. Project Software Engineer: Frank O'Brien, Principal of SSA Inc. responsible for translation of Mathmatica coding into C++ and Visual Basic coding and software production, production of executables and debugging. Also responsible for financial contracting with SSA, Inc. bookkeeping staff that has a long track record of government contracting in the US and abroad. Assistant Software Engineer: Zach Siegrist, SSA, Inc. staff member, responsible for preliminary executable software coding and testing as well as running simulations in coordination with Dr. Rensel. Seaweed consultant: Professor Charles Yarish, University of Connecticut will provide expert advice and guidance in updating our prototype metabolic model of Saccharina and additional macroalgae, drawing from his published work and from new data to be acquired during the field studies of other collaborators listed below and our existing project at Hood Head. SSA has worked with Dr. Yarish on several past occasions and on one publication. Pacific Northwest Region Kelp Growth and Ocean Acidification Mitigation Study: Dr. Joth Davis and Betsy Peabody, Puget Sound Restoration Fund are providing kelp stocking, growth and environmental data necessary to validate a Saccharina latissima AquaModel effort for the Puget Sound region in work funded by the Paul Allen Family Foundation and the U.S. Navy in coordination with the University of Washington Applied Physics Laboratory (Dr. Jan Newton and Dr. John Mickett) and NOAA PMEL Seattle. Project Advisor: Dr. John Forster, aquaculture consultant in Port Angeles Washington has been a leader in floating aquaculture development for several decades and published a volume with Battelle Laboratory on Seaweed Aquaculture. Broch, J. and D. Slagstad. 2012. Modelling seasonal growth and composition of the kelp Saccharina latissima. Appl. Phycol. 24: 759-776. Kiefer, D.A. 1993. Modelling growth and light absorption in the marine diatom Skeletonema costatum. In G. T. E. a. J. R. Fasham (Eds. ), Towards a Model of Ocean Biogeochemical Processes (pp. 93-118). Berlin: Springer-Verlag. Kim, J.K., G.P. Kraemer and C. Yarish. 2015. Use of sugar kelp aquaculture in Long Island Sound and the Bronx River Estuary for nutrient extraction. Mar. Ecol. Prog. Ser. 531: 155-166. Rensel, J., F. O'Brien, Z. Siegrist and D.A. Kiefer. 2015. Tropical Open-Ocean Aquaculture Modeling: AquaModel Tuning and Validation. Prepared by System Science Applications, Inc. Renton WA for Pacific Islands Region Aquaculture Coordinator, National Marine Fisheries Service and Blue Ocean Mariculture LLC, Kailua-Kona, HI. 75 p.
Rensel, J.E., D.A. Kiefer, J.R.M. Forster, D.L. Woodruff and N.R. Evans. 2007. Offshore finfish mariculture in the Strait of Juan de Fuca. Bulletin Fish. Res. Agen. No. 19, 113-129. Sjøtun K. 1993. Seasonal Lamina Growth in two Age groups of Laminaria saccharina(L.) Lamour. in Western Norway. Botanica Marina 36: 433-441. Yarish, C., B.H. Brinkhuis, B. Egan, and Z. Garcia-Esquivel. 1990. Morphological and physiological bases for Laminaria selection protocols in Long Island Sound. In: Yarish, C., C.A. Penniman, and M. van Patten (Editors). Economically Important Marine Plants of the Atlantic: Their Biology and Cultivation. Connecticut Sea Grant College, Groton, CT, pp. 53-94.